Originally posted: November 14, 2018 . Last modified: December 10, 2018 . Nothing beats a slice of homemade blueberry pie. 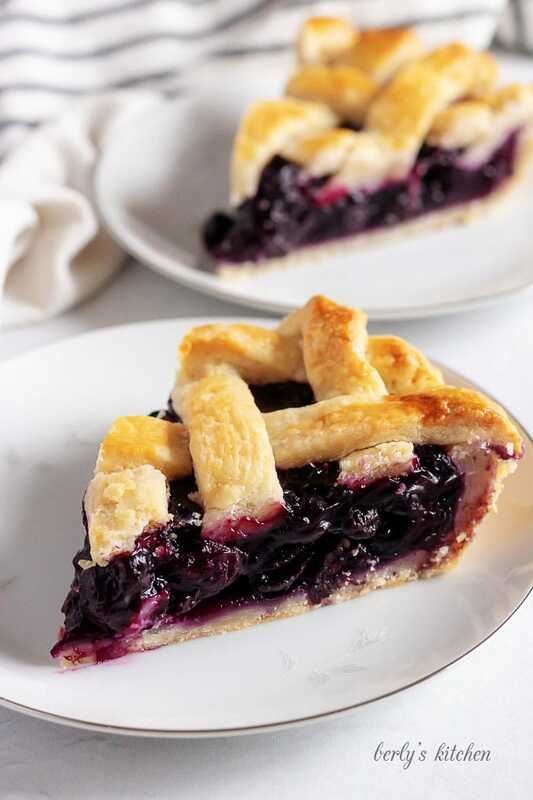 Our blueberry pie recipe has all the flavor of a homemade dessert but takes half the time to prepare. Man, this is my favorite time of the year! We get to bake up all kinds of treats, from bread pudding to peanut butter cookies, to chicken pot pie and maple glazed carrots. It’s a great time to be a cook. Personally, I don’t mind spending a lot of hours in the kitchen during the holidays. I get pleasure from seeing others enjoy the food I’ve prepared. However, not everyone feels that way and I understand completely. Many other people would rather be enjoying the food and festivities. For those individuals, we try to create recipes that look and taste homemade, but don’t require you to be sweating in the kitchen all day. 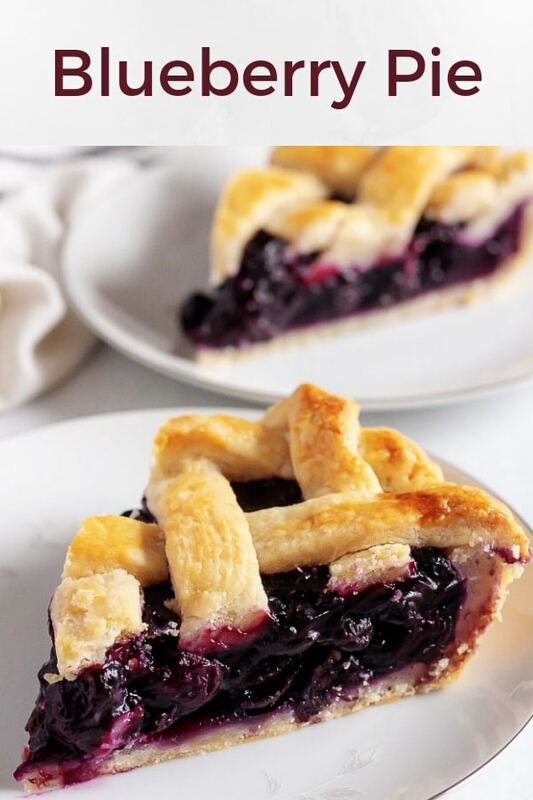 Keeping that in mind, we decided to share a simple blueberry pie recipe. While it may look complicated, I promise, it’s pretty easy. Moreover, I have added some additional tips and links below to help you spend less time cooking and more time celebrating the holidays with family and friends. Now, let’s get this pie rolling! First, start by preheating your oven to 400 degrees F. Then, go ahead and prepare your pie crusts. Whether you use homemade or store-bought, I leave that decision to you. For some important links, see the tips listed below. Once the pie crusts are ready, roll them out flat. If you need to use a little flour to dust the counter or your rolling pin, that’s okay. Go ahead and place one of the crusts into a greased 9-inch pie pan. You can use non-stick cooking spray if you don’t want to use the extra butter to grease the pan. Next, in a large saucepan, over medium heat, combine the blueberries, sugar, 1/2-cup of the water, and the orange juice. Stir everything together and let the mixture come to a boil. 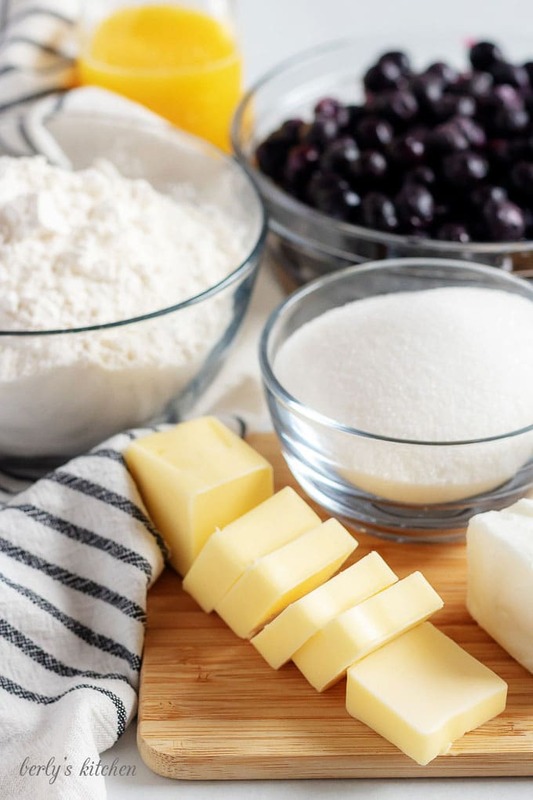 Now, while the blueberries heat, you’ll want to create a cornstarch slurry. You can do that by whisking together the remaining 1/4-cup of water with cornstarch. Once the blueberry filling starts to boil, slowly stir in the cornstarch slurry. Turn off the heat and let the pie filling cool for about 5-10 minutes. It will begin to thicken as it cools. After the filling has cooled for a few minutes, carefully, begin spooning it into the prepared pie crust. Honestly, you shouldn’t have anything left over, but don’t panic if you do. Save the extra filling and use it as an oatmeal topping or a use it to sweeten Greek yogurt. The point is, the more the cook, the more you learn to get creative with leftovers. Experiment and have fun with your food, don’t get discouraged, it’s all a learning process. At this point, you should be ready to top the pie with the other crust. It’s decision time again. Do you want a fancy lattice work topping or one solid crust on top? I leave that choice up to you. If you decide to do the lattice work like we did, then I encourage you to check out the tips below, because it can get tricky. Once you’ve topped your blueberry pie, it’s time to make the egg wash. Simply whisk together the egg and 1-tablespoon of water. The egg wash will then need to be brushed onto the top crust. Don’t go crazy, just a thin layer of the mixture will work. If you’re wondering why you should use an egg wash, then allow me to explain. See how the top of the pie is golden brown, well, that’s what the egg wash does for you. Hang in there, were almost to the last step. With the egg was applied, it’s time to crimp the edges of the crust and bake your blueberry pie. Place it in the preheated oven for 35-40 minutes and let it bake until the crust s golden brown. Last, remove it from the oven and let it cool for at least 30-minutes before slicing. Otherwise, it will not have “set,” and the filling will ooze out onto your plate. Feel free to top the pie with ice cream, whipped cream, or whatever your heart desires. For me, I like a dusting of powdered sugar. It doesn’t really add anything in terms of flavor, I just like the contrast of dark blue, golden brown, and white sugar. 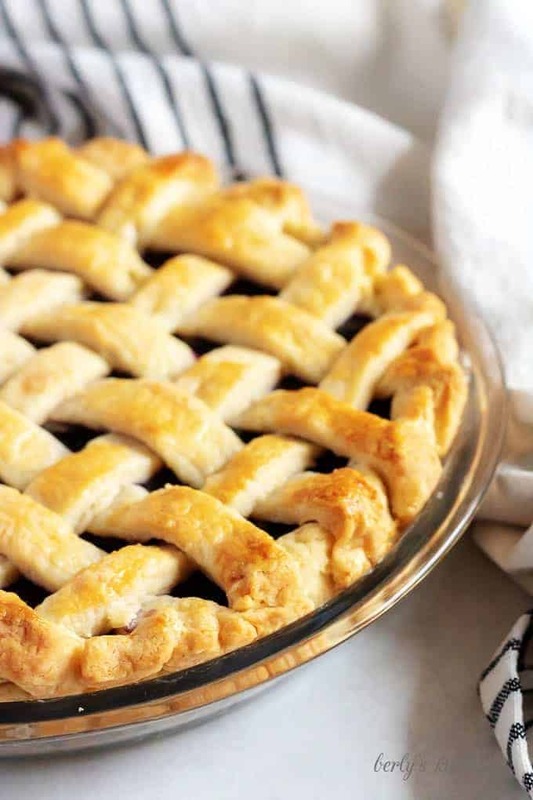 Lattice work on a pie can be tricky. 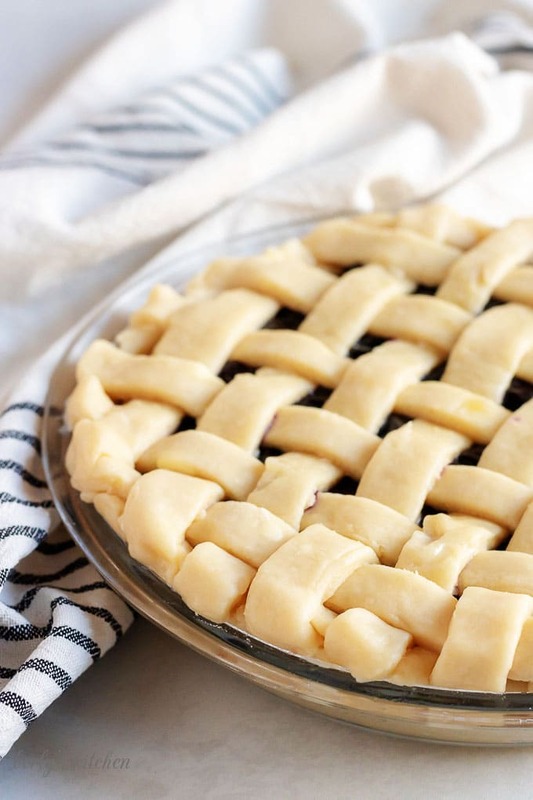 Fortunately, Rachel from Feast and Farm, created a wonderful video on YouTube that details a simple way to create a lattice pie crust. Click this link for her Blackberry Pie recipe. I believe at around 5-minutes into the video, she begins the lattice topping. 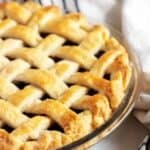 For a true homemade pie, you can use the same crust that we use for our Granny Smith Apple pie. It’s a little different from my personal pie crust, but the addition of shortening makes it a pliable crust that’s perfect for fancy pie crusts. If you really need to save time in the kitchen, but also want a gorgeous looking pie, then use store-bout crusts and pie filling. Stir in about 1/4-cup of additional sugar to the canned pie filling, then roll out the crusts. Put one crust into a 9-in. pie pan, add the filling, then do a lattice-work topping with an egg wash. Bake it, let it cool, and then serve. It will look homemade, but you’ll have saved a ton of time in the kitchen. Need more delicious dessert recipes? Then check out our Simple Homemade Cherry Crisp, Peppermint Cupcakes, or our Chocolate Cupcakes with Orange Frosting! 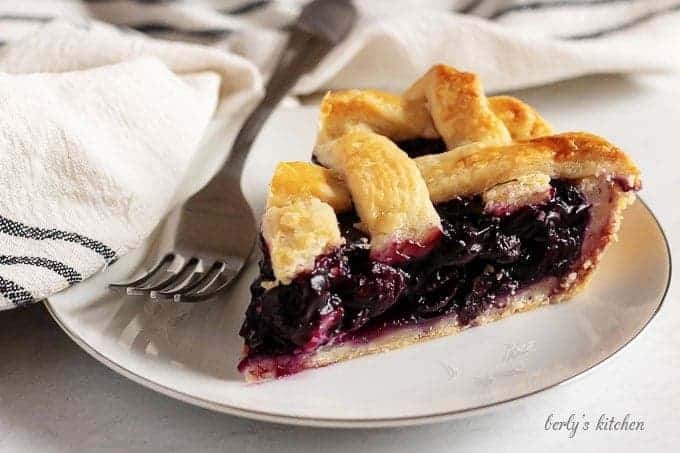 If you like our blueberry pie recipe, please leave us a comment and rate the recipe card. You can also find us on Facebook, Pinterest, Twitter and Instagram searching for Berly’s Kitchen! First, preheat your oven to 400 degrees F. Remove the pie crusts from their packaging and roll them out. Put one crust into a greased pie pan. Next, in a large saucepan, over medium heat, combine the blueberries, sugar, 1/2-cup of the water, and the orange juice. Now, stir the mixture until it comes to a boil. While it heats combine the other 1/4 cup of water with the cornstarch. Then, once the blueberries start to boil, add the cornstarch slurry and stir everything together. 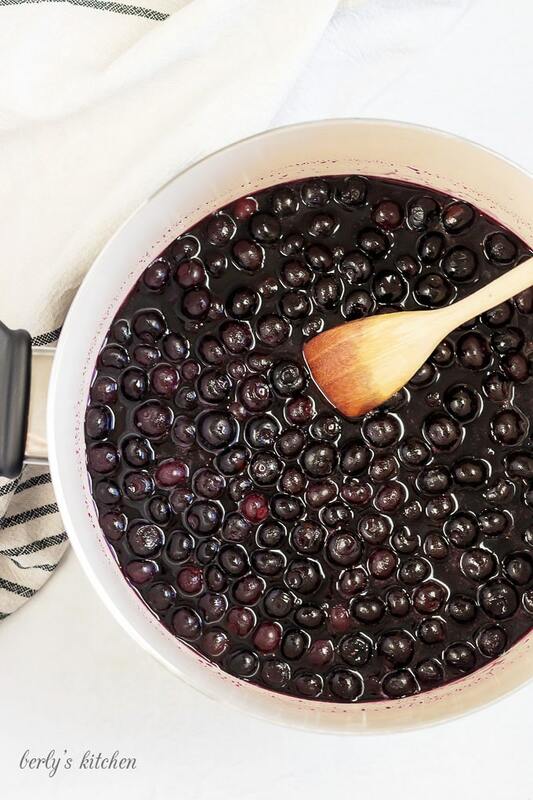 Turn off the heat and let the blueberries cool for 5-10 minutes. 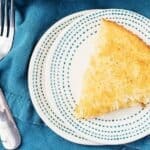 At this point, whisk together the egg and 1-tablespoon of water to create an egg wash. Brush the top of the pie with egg wash.
Last, crimp the edges of the pie and bake it for 35-40 minutes. Once done, let the pie cool for at least 30-minutes before serving.